Want to indulge a bit more in short row knitting? 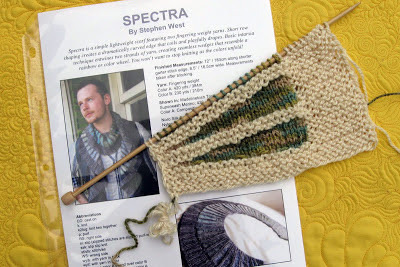 I saw a sample of this scarf, Spectra, by Stephen West, at Bliss Yarns on our "yarn and BBQ outing" last fall— inspiring. Bliss was out of patterns at the time, but I came across the scarf again at a knit shop in Birmingham while visiting The Smocking Bird. "Pattern is in stock..." "I'll take one, please." So, here's an enchanting project that will quench your thirst for short rows and give you practice with basic intarsia colorwork as well. Spectra scarf pattern by Stephen West. The yarn and color combos for this gracefully curved scarf are infinite. Solids (with some contrast, of course), heathered, variegated, hand painted (ooh, wouldn't that be pretty? 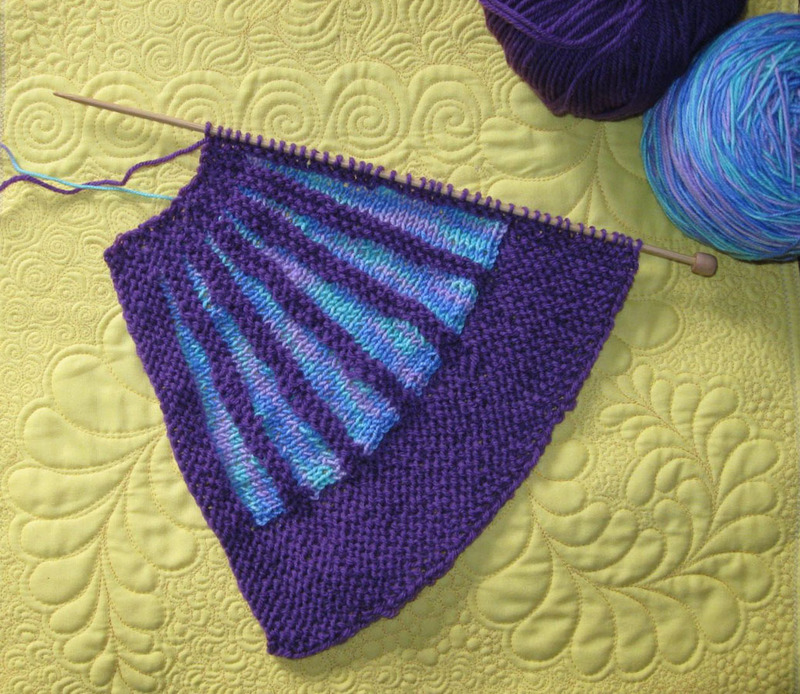 ), and those with a long color change that would fill each intarsia wedge would all be magnificent. I'm working it (above) in a worsted weight yarn [Heaven by Universal Yarn: 50% silk/50% Merino wool] and modified the number of cast on stitches. My other version—also a WIP (work in progress)—uses Rosebud from Debbie Macomber's Blossom Street collection, accented with Yummy, a sock weight yarn. It looks like stained glass to me. Spectra scarf with Rosebud (color: iris) and Yummy sock yarn. I don't know which one will get finished first. They are both pretty.